Lighters that are refilled by liquid fuel (usually naptha) and usually featuring flint ignition. Flip top chrome polished lighter with assorted designs. Refillable with Ronson or Zippo Fluid. 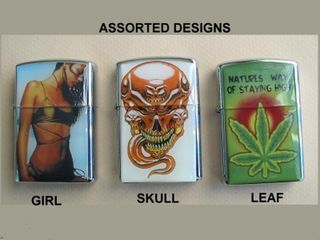 Please specify whether you would like a Girl, Skull or Leaf design.